Icelandic atmospheric black metallers Auðn are the latest offspring from the burgeoning black metal scene in this land of ice and snow to set their dark sails for foreign shores. The band will release its second full-length album “Farvegir Fyrndar” on November 10th, 2017 via Season of Mist. 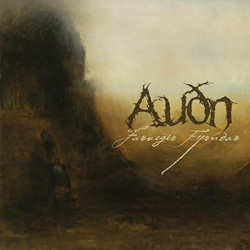 On their new work, Auðn deliver haunting melodies and beautifully frozen atmospheres, as opposed to the jarring and caustic blunt force trauma that has recently brought the island to the black metal forefront. With “Farvegir Fyrndar“, Auðn not only demonstrate the impressive progress of their songwriting skills but also deliver a clear definition of their very own black sound. The band has unveiled the beautiful cover artwork by Myrmann, as well as the album tracklist. They have also premiered the closing track “Í Hálmstráið Held” from the upcoming album. “Farvegir Fyrndar” can be pre-ordered in several formats (digipak CD and vinyl editions) and bundles in Seasons of Mist official webshop.